Online Registration will close September 28, 2018 at 11 PM. At that time no additional family registrations will be accepted. Late Registration for Individual Adults and Youths will still be accepted (Cash, Check or Credit Card) in person at Concord Carlisle High School during Kicks for Cancer on Saturday, September 29th from 2 PM to 8 PM at the entrance to Doug White Turf. 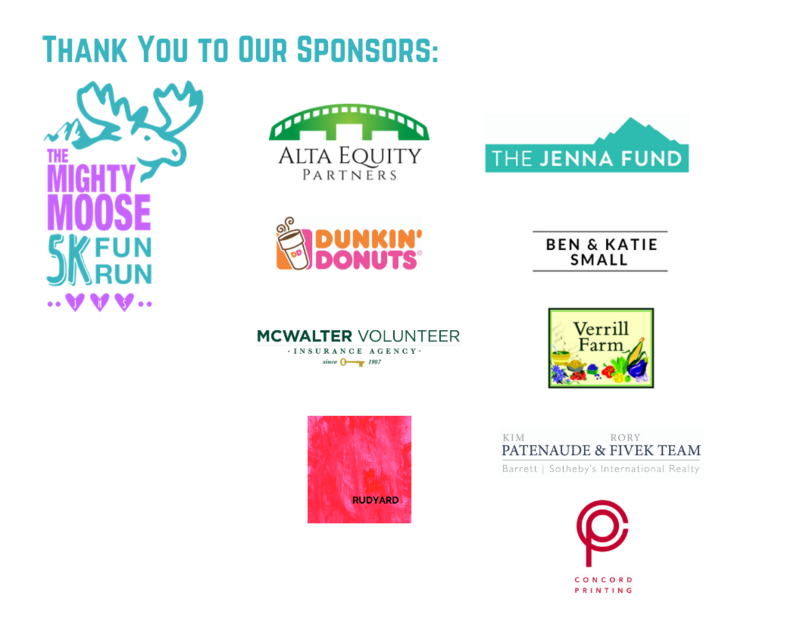 The Mighty Moose Fun Run/Walk is held in memory of Jenna Swaim, a loving mother and wife who lost her courageous four year battle to ovarian cancer on July 3, 2018. She was 43 years old. All funds raised will support ovarian cancer research at Dana-Farber Cancer Institute. The research is under the direction of Dr. Ursula Matulonis, Chief of the Division of Gynecologic Oncology at Dana-Farber. The name of the event is inspired by Jenna’s Alaskan roots, love for fun, and strength! The event is part of the Kicks for Cancer weekend, which is the very successful Dana Farber fundraiser that Ray Pavilk and the Concord Carlisle High School soccer team started several years ago. Jenna herself had gone pretty far down the path to organizing this race while she was receiving cancer treatment. Her children Luke, Jason, and Nora felt strongly after Jenna passed away that we should continue Jenna’s work and launch the first annual race this year. We are very excited that a group of Jenna's friends are working hard to organize the event so quickly. This will be an annual event that we will build and grow over time. Jenna Hoge Swaim, age 43, of Concord, Massachusetts, died peacefully at home on July 3, 2018, after a four-year battle with ovarian cancer. Born in Anchorage, Alaska, Jenna grew up enjoying the majestic views and pristine landscapes of Alaska. She earned a bachelor's degree from Yale University in 1996, where she played varsity soccer, earned multiple league honors, and served as the team captain her senior year. Upon graduation, she worked in investment banking at Goldman Sachs and Morgan Stanley and received a Master of Business Administration from the Tuck School of Business at Dartmouth College in 2001. She transitioned from finance to human resources and worked at OneBeacon Insurance and PeopleFluent, all while raising her young family. Jenna thrived in and loved her career. Jenna met Derek Swaim the first weekend at graduate school. They shared passions for sports, the outdoors, and traveling and after getting married settled in Concord, Massachusetts. She cherished nothing more than Derek and their three beautiful children Luke, Jason, and Nora, and she put all of her incredible spirit, talent, and energy into her family. They brought smiles and laughter to her heart every day. Jenna was active in her community and tirelessly supported her children's schools, clubs, and abundant activities, always cheering for, and often coaching, them and their teams. With her family, she enjoyed hiking, biking, running, golfing, skiing, and the outdoors, and together they traveled extensively. Her extended family and friends were also very important to her. Jenna possessed a gift for forming lasting friendships wherever she went. She loved getting family and friends together. She was tremendously thankful for all the support that her sister, family, friends, neighbors, and children's teachers provided to her family and her. Her positive and kind attitude was infectious. She will be remembered by the many lives she touched for her bright smile, humility, thoughtfulness, strength of character, and dedication to every endeavor. Jenna loved life, cherished it, and lived it to the fullest. She was extremely grateful and felt lucky to have had such a full life in a short period of time. If you can not attend on September 30th and would like to make a donation, please email us at mightymoosetreasurer@gmail.com with your name and contact information or follow the "Donation Only" registration option below. Registration tables will open at 7:00 am. The morning will start at 8:30 am with the 1 Mile run for children 12 and under on the CCHS campus. The 5k Fun Run/Walk will start at 9:00 am. The route will start at CCHS, continue past Alcott School and the Hunt Gym before traveling on Main Street through Concord Center with the return to CCHS via Walden Street. There will be plenty of volunteers along the route. Following the 5k Fun Run/Walk there will be a post-event gathering at CCHS with light refreshments. Please plan to enter CCHS via Walden Street. The Thoreau Street entrance will be closed to car traffic at 7 AM and will reopen shortly after the start of the 5k. We will have volunteers to help direct you to parking spaces in front of the high school. Plan to arrive by 7:45 AM for the Kids 1 Mile Run and by 8:15 AM for the 5k. Please do not park on either driveway leading up to CCHS. We have met with the Beede Center and are asking Registrants who are members of the Beede Center to use their lot. Please park at the far end of the Beede lot that is closest to Walden Street. 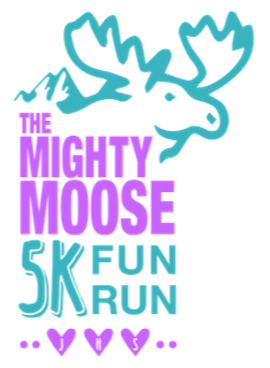 Event Questions: Please contact us at Mighty.Moose.5k@gmail.com.